Oh, that definitely smacks of southern France. My goat-cheese-loving daughter would really enjoy it, I’m sure. This looks fantastic. Oh, summer tomatoes. Yum. Mmmmm, this looks really delicious! 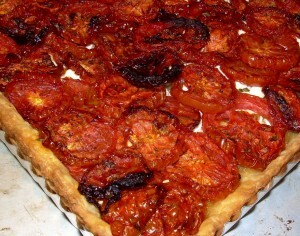 Love the idea of tomatoes in a tart like that…yum! sounds amazing. I’ll take a slice right now please! Your entries always surprise me. I would love a big slice of this right now. Wow–this looks good! You don’t see a lot of ‘savory’ tarts! YUM! Ooohh! That sounds fabulous. I love tomatoes and goat cheese. In terms of eating, I think I like savory over sweet pies, not that I don’t like the sweet ones. Tomatoes and cheese is simply more appealing to my taste. I am planning on making a tomato pie, next week. I wanted to make it this week, but we had do much good food on hand, I waited. Although, I am not adding cheese to mine, your photo has given me quite a longing for tomato pies. Ooooh, see, I’ve been wanting to try roasting tomatoes for a long time… this looks like a perfect excuse to finally try them. I love how you usually do savory pies for this and this one might be my favorite you’ve ever done! Looks perfect and something I’ll try my own hand at very soon!